What’s more interesting is the fact that Gulf Shores, Orange Beach and Fort Morgan attract about 4.9 million visitors each year, and most of those visitors aren’t even aware of this incredibly fascinating place just down the street on a remote strip of land, a place that played such an important role in protecting supplies and goods being shipped into Mobile Bay during the Civil War. 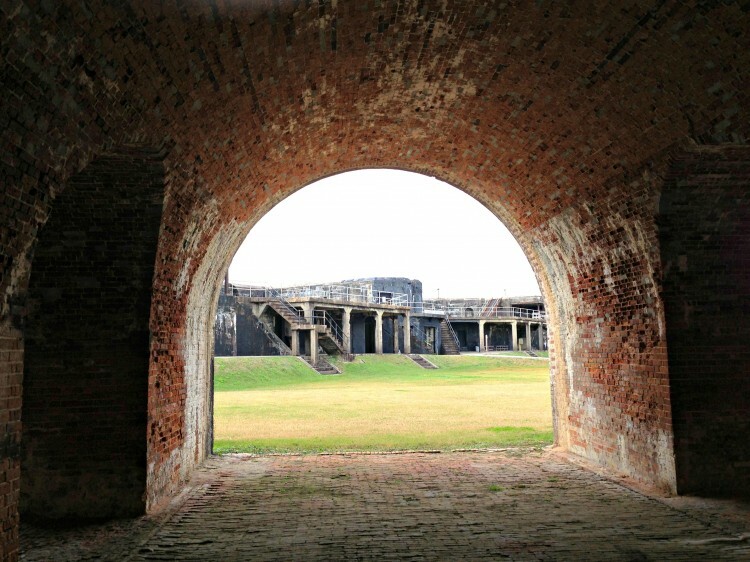 Fort Morgan, named the Guardian on the Bay, still majestically watches over the mouth of the Bay and worked in conjunction with two neighboring forts, Fort Gaines (located across the Bay from Fort Morgan on Dauphin Island) and Fort Powell (which was located at Grant’s Pass), in protecting Mobile Bay during that time. The tunnel under the glacis, called the postern, connects the glacis to the fort’s main entrance. 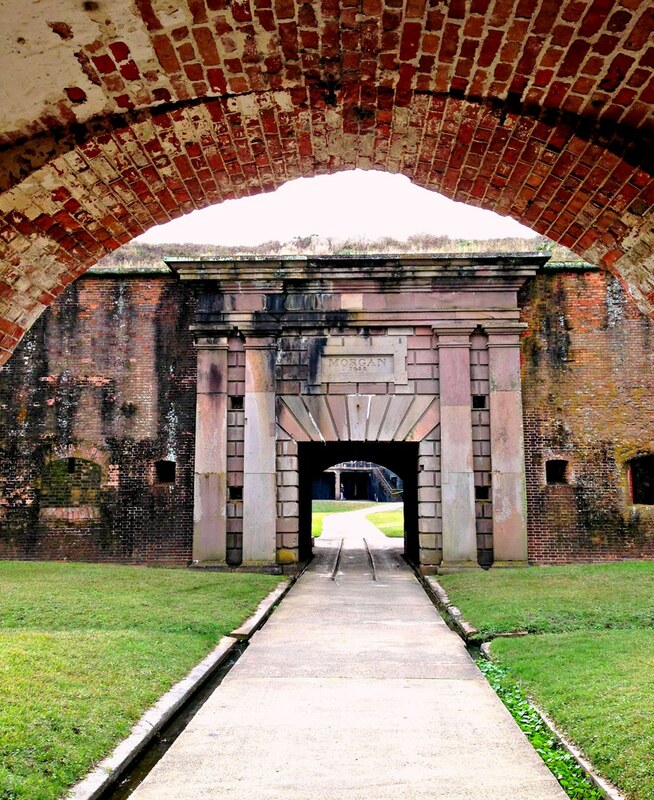 On the other side of the tunnel, you arrive at the sallyport, the fort’s main entrance. Years ago I learned a design phrase that has stuck with me since. I use it in design whenever possible and love to notice it in the built environment. 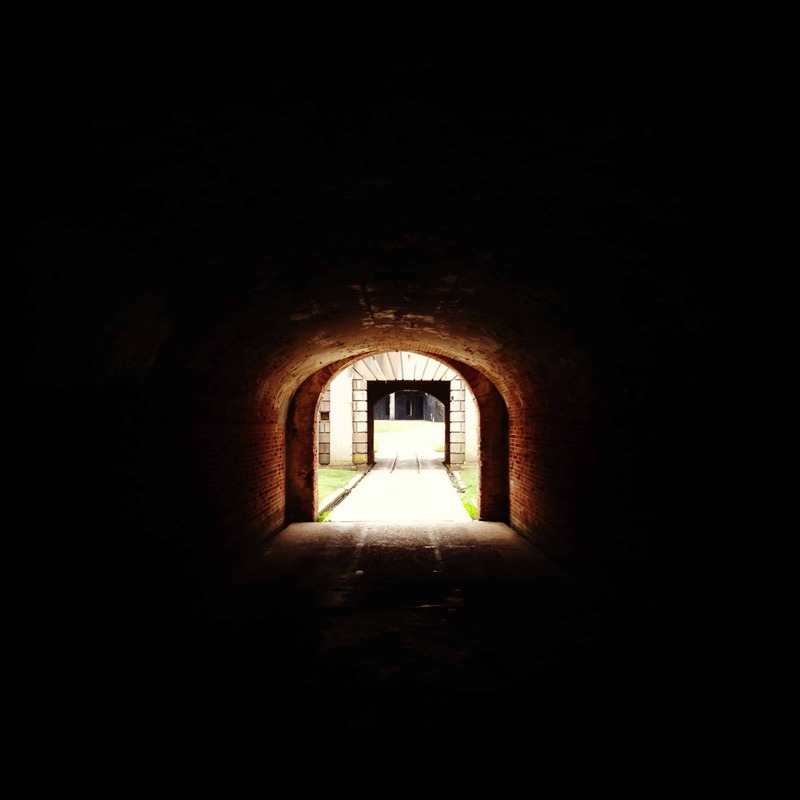 “At the end of every vista, there should be a reward.” As you near the end of the tunnel, the reward begins to reveal itself, the sallyport! Difficult to read in the photo, the name of the fort and the year it was named, not to be confused with the year it was completed, is inscribed on the sallyport. 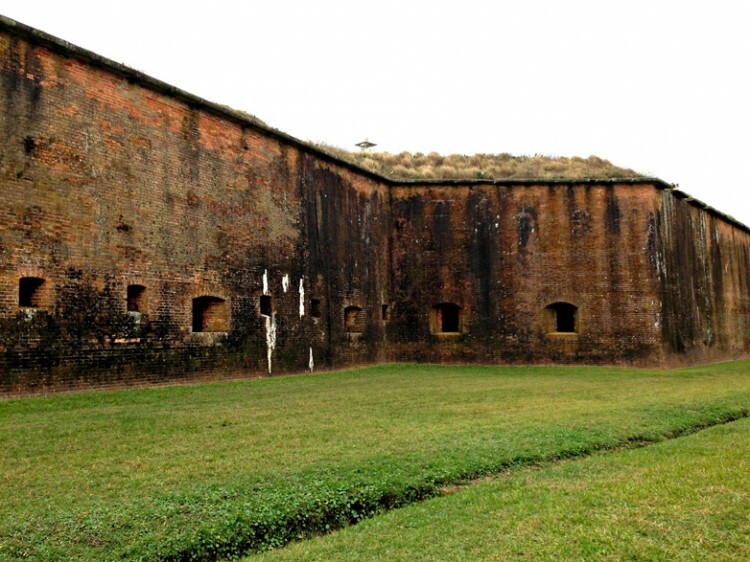 The fort was named for General Daniel Morgan in 1833 and was completed in 1834. Not to worry, those are the only two dates you’ll hear this entire blog. The grassy area seen in the above picture between the tunnel and the sallyport is the dry moat. It is known as the “ditch” between the fort entrance and the glacis. It looks as if it may have held water but actually never did. 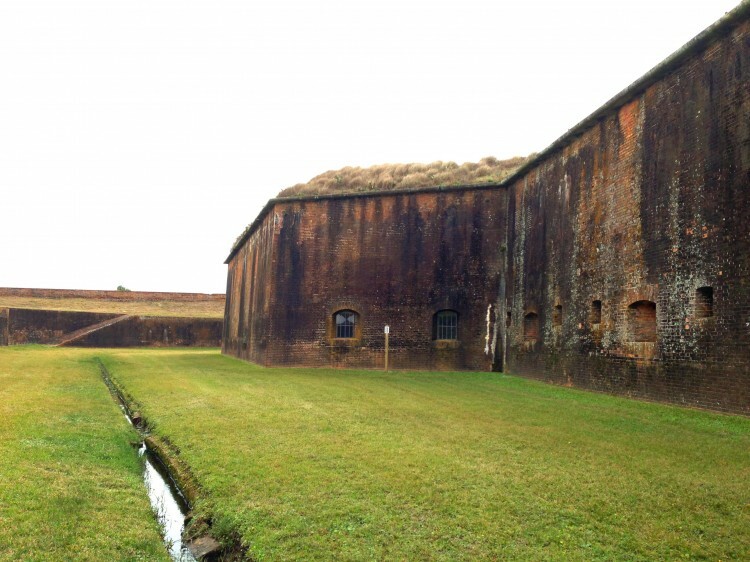 There is a brick lined drain that runs through the center of the dry moat that carries rain water out. 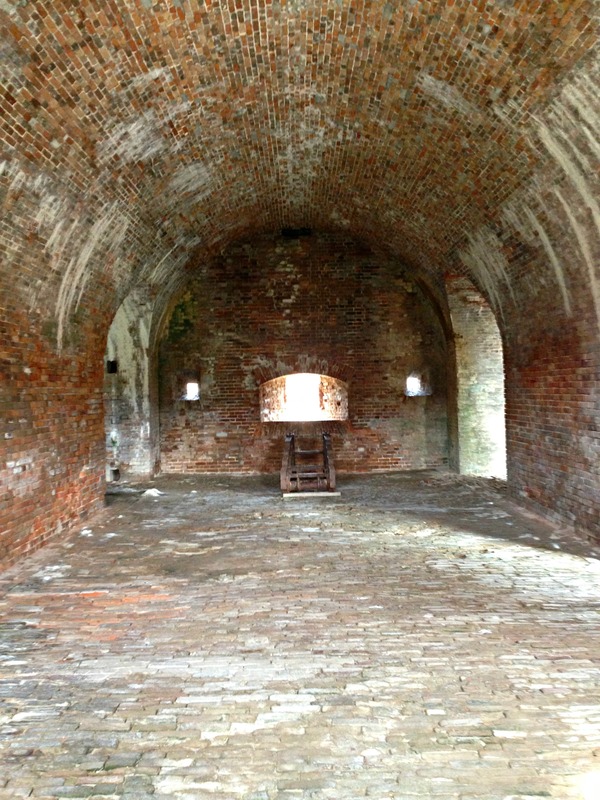 Below are pictures taken from inside the dry moat before entering the fort’s main entrance. I learn and retain information by doing, touching, seeing, and being engaged. I think most people do, too, especially children. 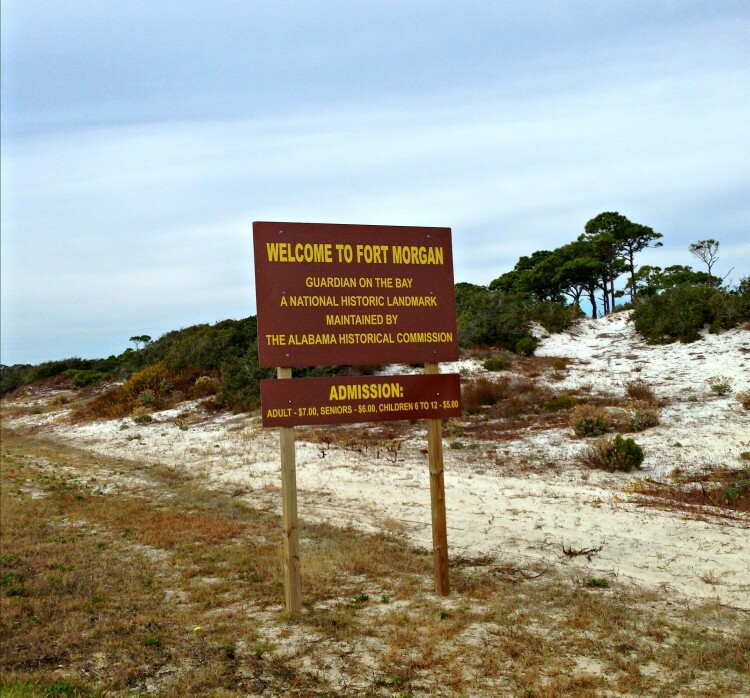 The first time I visited Fort Morgan, I laughed to myself when I saw that famous quote displayed, because up until then, the only thing I could remember about The Battle of Mobile Bay was that quote. 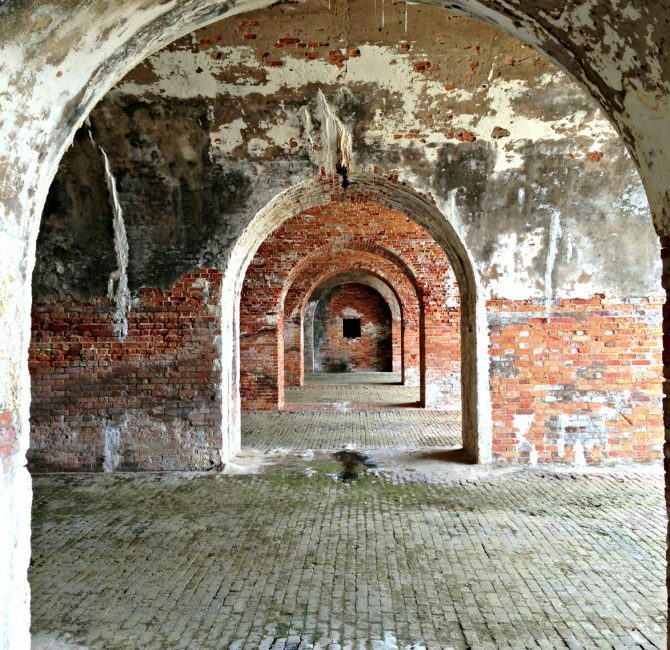 Seeing this place, the repeating brick arches and ethereal and somewhat ghostly light that shines in the cell-like rooms, hallways and windows is reminiscent of being in a graveyard or abandoned jail. Touching the bricks, concrete, and seeing the stalactites hanging from the ceiling is like being in a cave and the translucent quality of the white, lime deposits dripping from the mortar down the walls and on the floor makes it look like it’s covered in slippery ice. 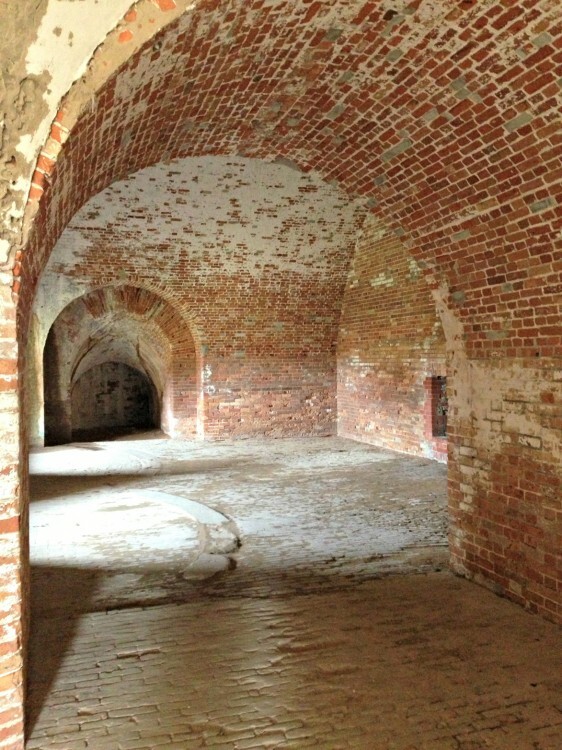 Casemates are the arched rooms inside the fort designed as protected gun positions for the cannons but were often used for storage and living quarters. 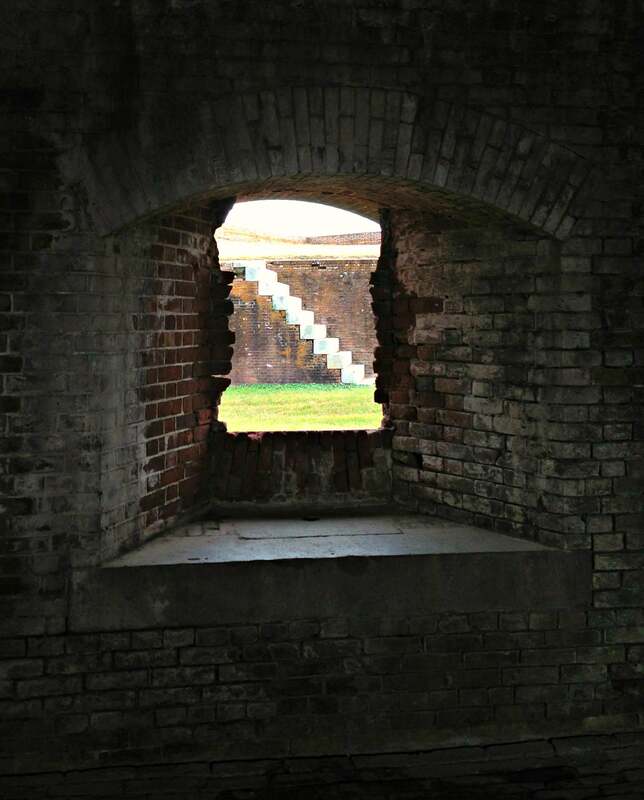 A view of the stairs across the dry moat from one of the windows in the casemates. 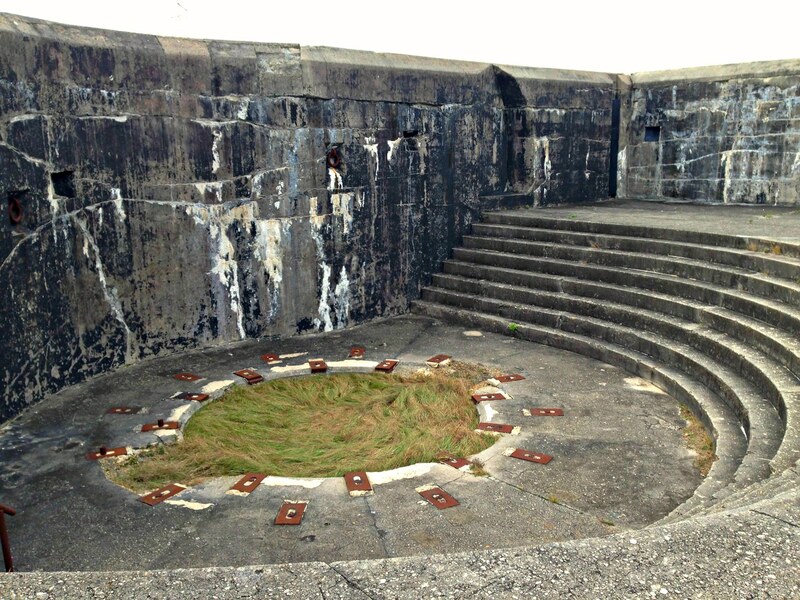 Gun Mount of Battery Duportail. 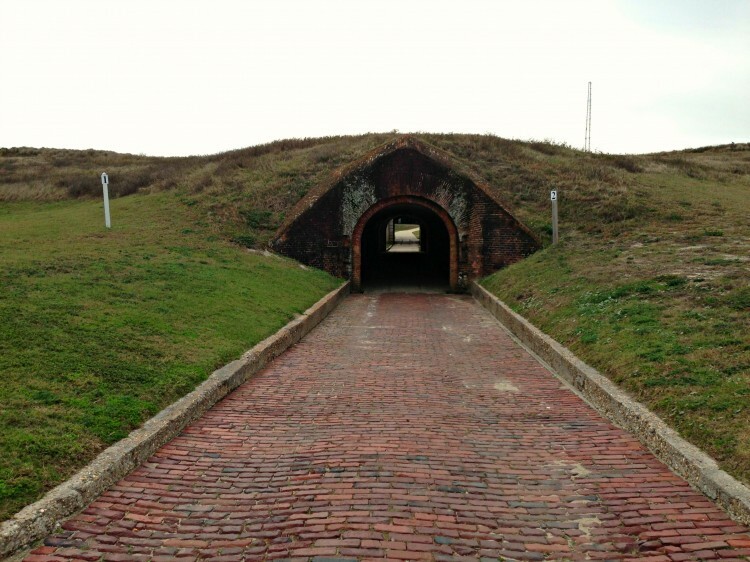 While there are many activities, encampments, living history programs, and a museum located at the fort, the spectacular view is certainly not to be missed, and something everyone will enjoy, even those who aren’t “into history.” From the top of Fort Morgan the vantage point is breathtaking. 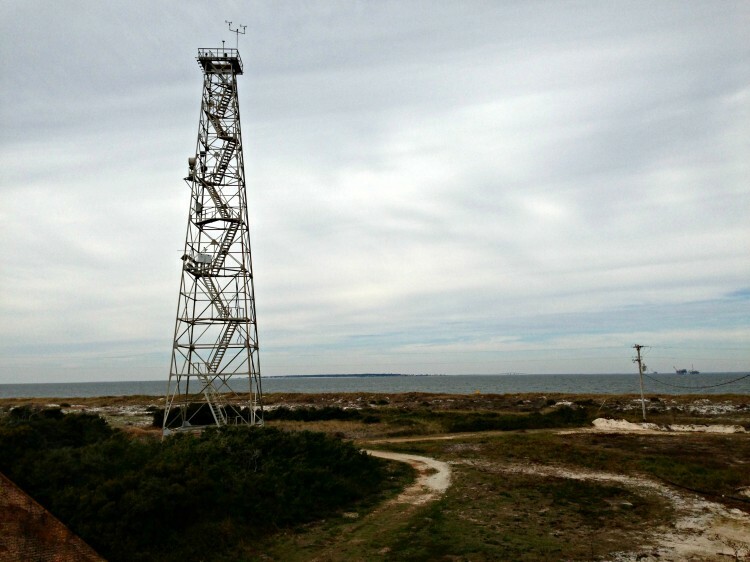 One has a clear view of Mobile Bay on one side, the Gulf of Mexico on the other, Dauphin Island directly in front across the channel, Sand Island Light in the distance, and some of the most pristine, untouched beaches in Alabama. 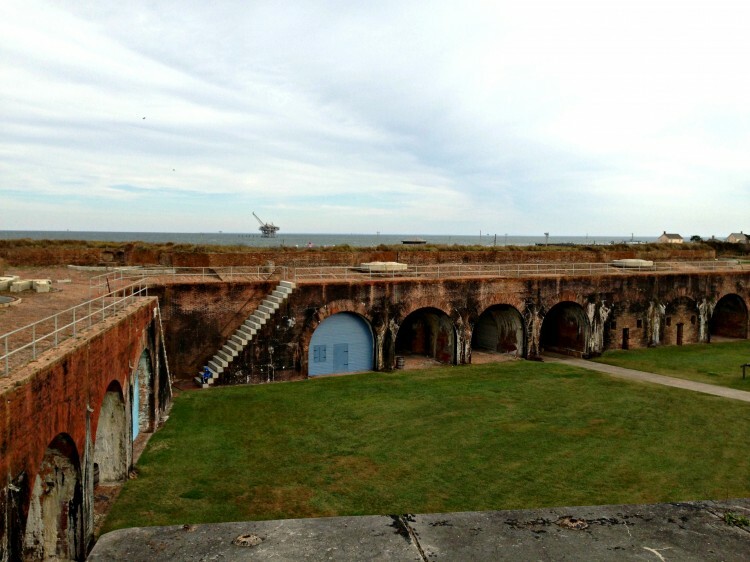 In my opinion, this is one of the most special things about Alabama’s coast, the fort and the beach. Fort Morgan peninsula is not littered with high rises like so many other coastal vacation destinations. In fact, much of it remains protected white sand and animal habitats teeming with wildlife and indigenous plants. From the top of the fort you can see the lay of the land, the shape and size of the channel the boats were entering, why the forts were so critically positioned to protect Mobile Bay, and you can get a clear picture and understanding of the events in your mind. 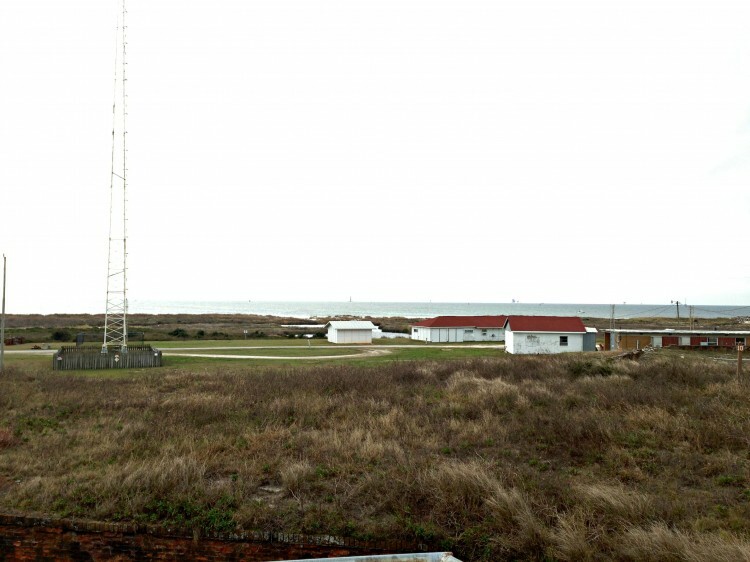 Gaining access to Mobile Bay was crucial to the outcome of the American Civil War. Top of the fort looking towards Mobile Bay. 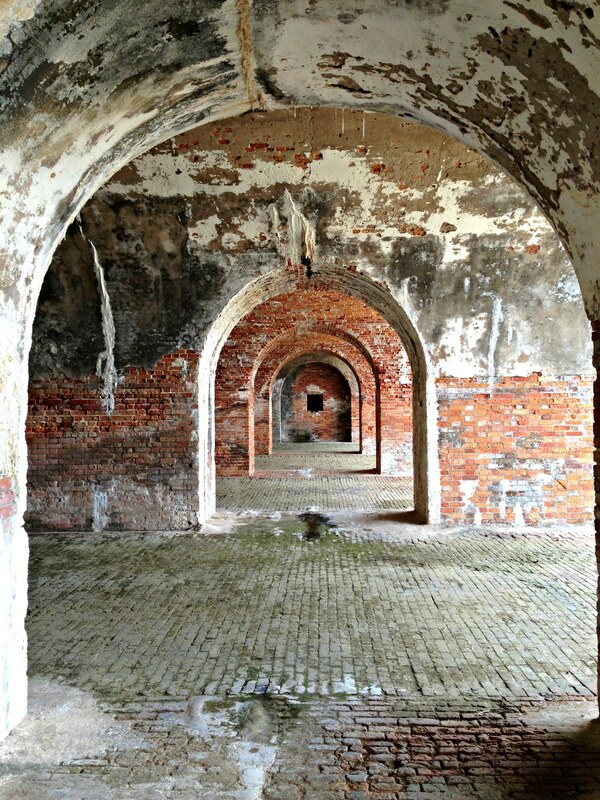 The two arches in the fort on the right side of the photo that are bricked up are the powder magazines. The magazines held 60,000 lbs of black powder to operate the fort’s cannons. 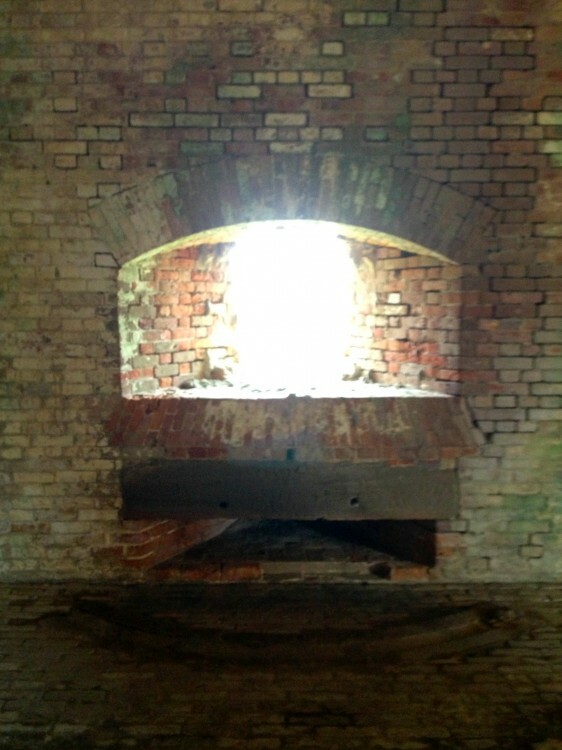 The windows in the magazines were designed for ventilation. View from the bastion (one of the five projecting corners of the fort and strategic cannon positions) looking across the mouth of Mobile Bay to Dauphin Island, where Fort Gaines is located. View from the bastion looking out at the Gulf of Mexico. 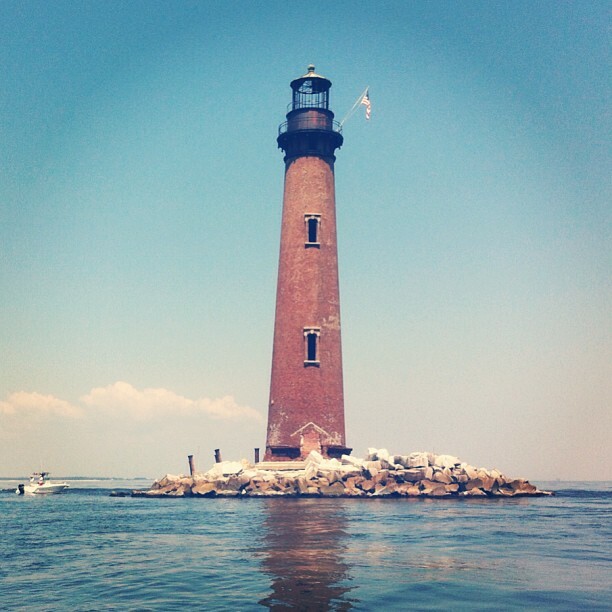 Sand Island Light is directly in the center of the picture in the distance. Why should you go? Because at some point on your trip you’ll be sitting on the beach, gazing out into the Gulf of Mexico, and probably won’t even think about the ships that entered Mobile Bay, about the USS Tecumseh, the iron-clad monitor (warship) that is still at the bottom of Mobile Bay just off Fort Morgan that the Smithsonian is in the process of trying to raise (yep, there is still a warship at the bottom of the Bay, holding treasures and relics never seen before, while fisherman and pleasure craft motor above), or about the many lives lost in the Battle of Mobile Bay. At one time, enjoying this beach wasn’t even possible due to war. It’s hard to believe this place exists so close to everyday life. 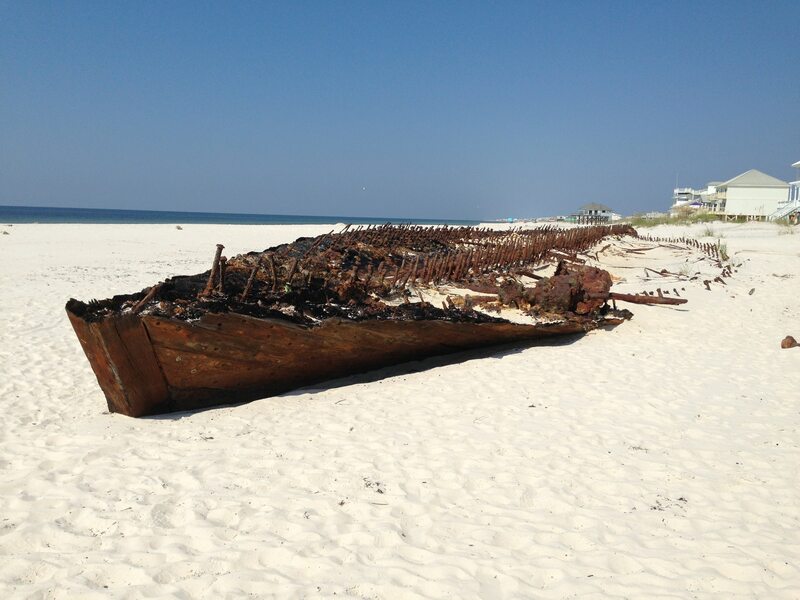 It’s hard to imagine Gulf Shores and the surrounding area is visited by so many people annually, yet this remarkable place is so often overlooked. You don’t need to stay all day, it’s inexpensive, and the self guided exploration is perfect for those who “aren’t into history” but the pentagon shaped fort, which you can’t even see when you drive up to, is such a mystery and a departure from the colorful beach stores, big restaurants and miles of high rises and houses in Gulf Shores. 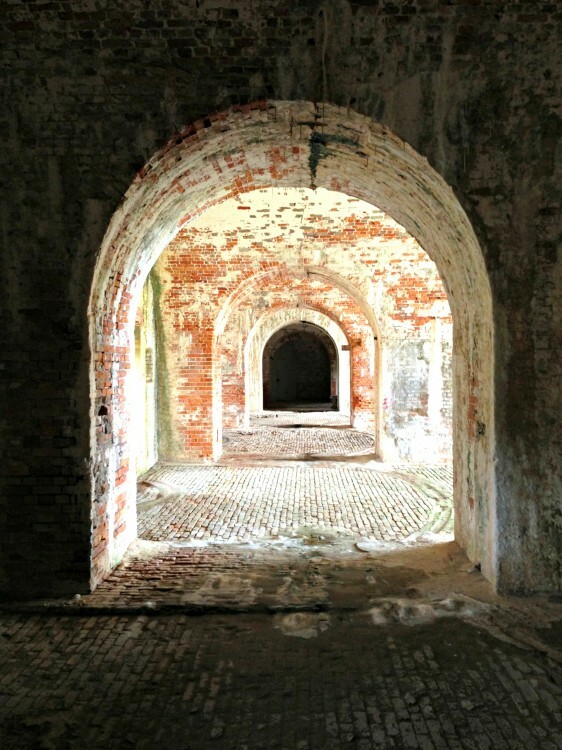 Although it is outside, the fort is quiet like a cathedral, architecturally and historically beautiful, and sobering when you imagine everyday life in the fort, which is nearly impossible to do. And finally, you might be like I was and remember that famous phrase and nothing else about The Battle of Mobile Bay. Being there, connecting the dots and understanding something you’ve read about in books is worth more than cheap memorization. Overtime much of that memorization without context is lost anyway. Fort Morgan is a place you can’t fully comprehend in books or pictures. It’s one you must see and feel.